While a good majority of the tax changes in the 11th hour Fiscal Cliff bill (American Taxpayer Relief Act of 2012) concern individual taxes, there are a few changes for small business owners, which are mostly centered around the extension of and retroactive change to depreciation limits and rules. In 2011, we had a $500k limit on the amount that could be taken as Section 179 depreciation expense (provided the business purchased less than $2 million in qualifying property in the year). This limit was very generous and few small businesses had to worry about getting close to this limit. However, in 2012 the limit was scheduled to be reduced to $139k (after inflation adjustments), and then even further reduction to $25k in 2013. For small businesses that acquire a lot of equipment each year, such large limit reductions would have a big impact. All of 2012, we were unsure if Congress would increase the Section 179 limit, and finally after the ball dropped in Times Square and many of us had resigned ourselves to the 139k limit, our bickering government representatives finally get it together and decided to make a retroactive change to the 2012 limit. Now, it is as if the the treat of the $139k limit never existed, and we now have a $500k limit for 2012 and 2013. Now, correct me if I am wrong, but I thought the purpose the Section 179 depreciation benefit was to encourage business owners to buy more business equipment and help spur economic growth? How are we suppose buy equipment when our government does not decide on the depreciation limit until after the year is over? I had several clients that typically buy more than $139k in equipment that were trying to make purchase decisions at year-end, and the delay caused by partisan politics in Washington on this limit was extremely frustrating. Is bonus depreciation ever going to truly go away? It seems it is always brought back by 11th hour legislation. Unfortunately, this time around we only have 50% bonus depreciation that is extended through 2013. While businesses with net taxable income will use Section 179 depreciation, bonus could be useful for those with losses. In 2011, we were spoiled with 100% bonus depreciation, and we pretty much wrote off everything in the first year that qualified. Now we are going to be a little more limited, but it is still a good benefit if you remember back to years before bonus was available. At best, it provides a great first year deduction for those of you who purchased new vehicles weighing less than 6,000 GVW. Even with 50% bonus depreciation, you are still going to get $11,160 in depreciation in the first year ($11,360 if a light van or truck) given that most new vehicles are well over $22,320 these days. Remember, it has to be a brand new. Certified new does not qualify. Even though this one will greatly benefit my calendar year filing businesses, it frustrates me to no end that Congress would make this change retroactive to 2012. Not only did it make one paragraph from my book obsolete, but we are going to have to file several amendments for our fiscal year corporations that have already filed tax returns with qualified leasehold improvements put into use after 1/1/12. In 2011 (and several years prior) you could depreciate qualifying leasehold improvements over 15 years and then use Section 179 or bonus depreciation on the improvements. Before this rule, we had to depreciate them over 39 years, so this was a BIG benefit. Due to the patchwork of tax code in the last few years, the special treatment expired as of 1/1/12, and qualified leasehold improvements could no longer be depreciated over 15 years. Even worse, if you had any 179 carryover originating from qualified leasehold improvements at that point, you had to reclassify the amount (according to steps in Sec 179(f)(4)) and depreciate it under the 2012 rules over 39 years. Reporting this adjustment was a bit complicated since the IRS did really anticipate the expiration of the tax rules, so not only was it a lost benefit, but it cost fiscal year small businesses more in tax prep fees. Fortunately, there was some saving grace in that the qualifying improvements still qualified for bonus depreciation (since the availability of bonus treatment was not based on the 15 year life), so we were able to take 50% bonus depreciation, but the rest went over 39 years. Now, fast forward a few months after these fiscal year returns have been filed to when we are all enjoying New Years and watching football (or soccer in my case). Our government officials, in all their wisdom, decide to retroactively change the 2012 rules and make the 15 year special treatment available again. In addition, they extend it to 2013 as well, so it is as if the rules we used during 2012 for fiscal year filers never existed. Again, if you are a calender year filer and you made or are looking to make some leasehold improvements that qualify for the 15 year treatment, this is very welcome news. However, if you are a fiscal year filing corporation, your CPA may need to file amendments for you once the tax preparation software companies update their software for all the Fiscal Cliff bill changes. By the way, if you bought my book and would like more information on this change, please feel free to email me at pdxcpa@gmx.com. Again, it only changes one paragraph in the Fixed Assets chapter, but I would be happy to provide additional details on this change for my readers. In addition to the depreciation changes and the retroactive change that has me all riled up (much like the Cascadian supporter groups are at Don Garber), there were also some minor extensions that will benefit a select group of small businesses. The Research and Work Opportunity Tax Credits were both extended through 2013. The enhanced charitable deduction for contributions of food inventory is also extend through 2013, as is the special treatment of qualified small business stock. All in all, there was not much change for businesses; however, we will likely see more substantial changes later in the year. You may say I am a dreamer, but I am thinking we may actually see some comprehensive tax reform this year. As you can imagine, I have heard a lot of panic from clients since the election results came in last month. Some panic is warranted, as most acknowledge that the 2% payroll tax reduction will not be extended, capital gains will likely be increased to 20% or 25% at most, and that tax rates will likely be increased for married couples with AGI over $250k. However, when it comes to capital gains, panic can actually be very detrimental and cost you much more in taxes than you would think. Naturally, you would assume accelerating a large capital gains to take advantage of the 15% rate would result in large tax savings, but unfortunately the alternative minimum tax erodes the tax savings if you are a high-income taxpayer. In fact, most of the time it results in an overall tax rate between 20% and 25%. Why this happens is very complex and even CPAs get frustrated in fully understanding the alternative minimum tax, but here is the best explanation I could find. Basically, if a large amount of your income is long-term capital gain income and you are a high-income taxpayer, the AMT tax can kick in and erase the benefit of the 15% rate. We witnessed this quite a bit back in 2010 when financial advisers worried about the expiration of the 15% rate and advised their clients to sell off their low basis stock. It sounded like a great idea at the time, but when preparing the tax returns in 2011, many were surprised at how AMT tax erased much of the benefit. Well, the same thing can happen for tax year 2012 if you give in to panic. Before you make any big moves on capital gains before year-end, talk to your CPA and and have them run a projection to see what the true impact would be. It may just be that there is no need to panic. The following is an excerpt from my book, The Pocket Small Business Owner’s Guide to Taxes, and is important information for S corporation shareholders as 2012 is starting to wind-down. This is especially important if you use a payroll processing company, as they will need to include your health & dental insurance on your last payroll run. This is a time-sensitive matter, and failure to report your premiums correctly can be a very costly mistake. The reporting of health insurance premiums for a more than 2 percent S corporation shareholder can be a little confusing; however, it is crucial that it is reported correctly if you want to maximize your deduction. If you miss a few simple steps before the end of the year, you could end up limiting or losing your deduction all together. The self-employed health insurance deduction allows self-employed individuals to deduct their health insurance premiums on the front of the 1040 as an adjustment against income. Even though an S corporation shareholder is not technically self-employed, the IRS requires a more than 2 percent S corporation shareholder to report the deduction as if they were self-employed and not on the S corporation return. Below are the steps that have to be taken in order to get the self-employed health insurance deduction. Make sure you follow them closely as an error can result in the loss of substantial tax savings. An S corporation cannot deduct health, dental, and other medical premiums for a shareholder who owns more than 2 percent. Their premiums should be tracked separately in the accounting system throughout the year. If the corporation did not pay the premiums during the year, make sure the corporation reimburses them before the end of the year. Before the final payroll run of the year, calculate the total shareholder health, dental, and other medical insurance premiums paid or reimbursed by the corporation as this figure will be needed for the final payroll and the shareholder’s W-2. The amount of premiums for the year is paid to shareholder as payroll, but there is special payroll tax treatment for this payment. The amount is subject to Federal and State withholding, but it is not subject to social security or Medicare tax. If you use a payroll service, they will have a pay item for this specific payment. On the W-2, the amount of the premiums is recorded in box 1 wages, in the state wages, and in box 14 as “S/H Health Ins” or a similar description. Finally, on the shareholder’s individual tax return, make sure the amount of shareholder health insurance is deducted as self-employed health insurance on the front of Form 1040. The end result is that the payroll payment for the premiums is deducted as a wage on the corporation return, the wage is taxed as income on the individual return, and the self-employed health insurance deduction is taken on the personal return, which all nets out to a deduction in the amount of the premiums. This may seem like a whole lot of unnecessary paperwork, but it is much better than the treatment that results if you do not follow these steps. If a more than 2 percent shareholder fails to include their health insurance premiums on their W-2, technically the IRS will not allow the self-employed health insurance deduction on the individual return, and the shareholder would have to claim the premiums as a medical expense on Schedule A, which unfortunately is subject to a haircut of 7.5% of adjusted gross income (10% starting in 2013). This means that your deduction is reduced by an amount equal to 7.5% of your adjusted gross income, and if there is anything left then you get a deduction for the remaining amount. If you run the numbers, this is huge loss of deduction and a horrible penalty for not following the IRS rules. Given the high cost of health insurance premiums these days, it is very important that you make sure and follow the steps listed above each year. Have your tax professional help you and do not wait until tax time as amended W-2s can be costly to prepare. 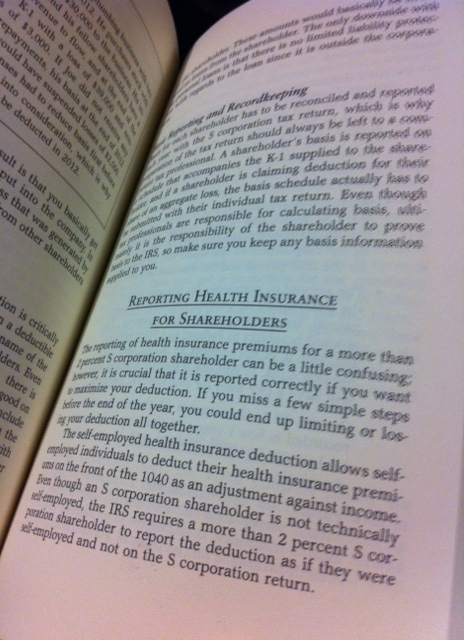 For more S corporation shareholder tax advice like this, refer to Chapter 9 in my book. The shoebox accounting system – this is a great idea if you want an extremely high bill from your tax professional. For the best results, have the receipts wrinkled up and mixed in no particular order, add random pictures of your pet or a recent vacation, and make sure you include some receipts from different years just to keep your tax professional on their toes. The handwritten, single page summary of income and expenses – nothing instills confidence in a tax professional like a list of income and expenses with no backup that resembles a grocery list – especially when all the numbers are conveniently rounded. Saving twelve months of banks statements for your tax professional – this is not really even an accounting system, but you would be surprised how many clients save twelve months of accounting input and reconciliation work for their tax professionals to complete during tax season. This is a good system if you enjoy finding a new tax professional each year. The “is it personal or business?” accounting system – mixing your personal and business transactions in a personal finance software file is another winner with tax professionals as it creates hours of never ending trivia. The “good intentions” accounting system – this disaster is often the result of an owner who bought a popular accounting software package with the great intention of getting training and assistance, but in the end just quickly input all the transactions and posted them haphazardly, leaving a big mess for their tax professional to sort out. Hopefully you get the point from these examples – an accounting system has to be organized, detailed, accurate, and timely. This is can be done manually, with computers, or a mix of the two. Annual exclusion for gifts increases to $14,000 for 2013, up from $13,000 for 2012. The 401k elective deferral limit for employees increases from $17,000 for 2012 to $17,500 for 2013. This also applies to 403(b), most 457 plans, and the federal Thift Savings Plan. The corresponding catch-up contribution for employees age 50 and over remains unchanged at $5,500. If your 401k plan has profit sharing, the maximum employer contribution increases from $33,000 in 2012 to $33,500 for 2013. This increases the maximum defined contribution limit to $51,000. The SIMPLE IRA contribution limit increases to $12,000 in 2013, up from $11,500 in 2012. Like with the 401k, the catch-up contribution limit for SIMPLE plans remains unchanged at $2,500. The first 2012 Presidential debate will take place on Wednesday, and this time it will be focused on domestic policy. One of the most important domestic issues right now is the “Fiscal Cliff” and tax reform that is long overdue. I highly recommend you read through CCH’s outline of the tax policies of each candidate before Wednesday’s big event. It was released back on 9/11/12 and provides great analysis that is easy to follow even if you are not a tax professional. While actual tax reform will likely require a lot of compromise from both parties, it is good to have an understanding of both platforms, as ideas from each could end of shaping eventual reform in 2013 and beyond. My guess is that most small business owners are a bit apathetic this election cycle, as we all know that some form of tax increase is just around the corner regardless of who wins the election. After all, it is very likely that the 2% payroll tax holiday will be left to expire at the end of the year, and many high income taxpayers will have to starting paying the additional Medicare taxes resulting from the Health Care reform that the Supreme Court upheld in June.